It’s often the little things that make hotels stand out or leave a negative impression. The little things that guests notice …. but hardly ever tell the hotel. The Know aspires to make great hotels exceptional by creating a mystery guest club in which members, called Knowers, provide high-end hotels with valuable insight on how to improve their customer experience. 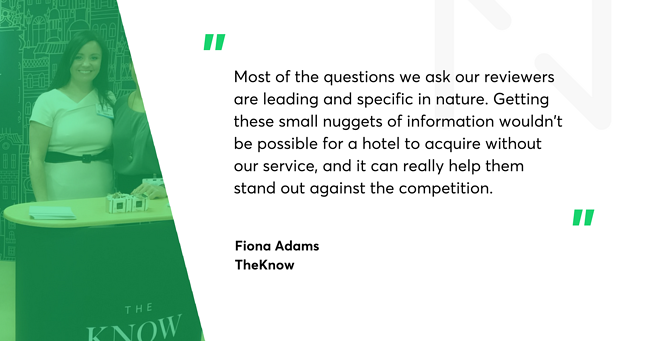 With a clear, unique selling point from any other mystery shopper programme, The Know gives hotels access to quality feedback from paying customers with a real guest experience. Netguru has helped The Know build its platform from scratch, and as they’re just before their next big release, I decided to ask the founders – Fiona Adams and Mané Ryatt – about their vision, challenges and biggest successes along the way. Natalia Chrzanowska: You and your partner both come from a banking background. What made you start a company in the travel industry? Mané Ryatt: Both of us have always been extremely passionate about travel and have had an opportunity, both professionally and personally, to stay in some truly amazing hotels around the world. Most of the time we would see little things that can be done differently at a particular hotel, or we had seen done better elsewhere. We’d say: “The hotel was lovely, but..”, and there’s always a ‘but’. We delved deeper to see how hotels try to acquire that information and the sources – obviously, they get complaints about certain problems and reviews on TripAdvisor or direct guest feedback, but how do they get ahead of that by getting deep insights from their guests in a confidential manner so they can address problems before they become public? We researched the subject for some time, talked to hoteliers and guests and realised that there really was a gap in the market and that the skills required to make it better were surprisingly similar to those we had acquired in banking. Fiona Adams: The subject matter changed, but our approach to The Know is very much the same as that we used in banking, as the skillset required is very transferrable. Mané and I have 35 years of banking experience between us in the areas of issue identification and problem-solving, risk management, process engineering and client service. We also have a lot of experience in product development and have managed both large-scale projects that require extensive knowledge of business model development through user experience and budgeting. A lot of techniques and approaches are very similar, but it is great to now be using those skills in an industry we are so passionate about, and where we feel that we can really make a difference. Natalia: The Know differs from a typical mystery shopper programme. Could you describe what distinguishes it from similar companies? Fiona: The key difference is that we invite real paying guests. In the typical programmes, the mystery guest might be a hotel professional or an individual whose job is to review different services. Whereas we have guests who actually stay at a hotel for a minimum of two nights, often longer, and are paying out of their own pockets. Therefore, they provide the hotels with more reliable and valuable insight based on a real-guest experience. Mané: Knowers, as we call our reviewers, go on holiday as they normally would – they take their partners, kids, pets…whoever they’d normally take with them on holiday. So you get feedback from those who stay for a longer period. Whereas, quite often, if you have a mystery shopper, they come on their own, have breakfast, lunch and dinner only to fill out the survey, after which they’re gone. Natalia: Could you describe how, in your opinion, such feedback can help hotels provide exceptional guest experience? Fiona: Most of the questions we ask our reviewers are leading and specific in nature. Getting these small nuggets of information wouldn’t be possible for a hotel to acquire without our service, and it can really help them stand out against the competition. 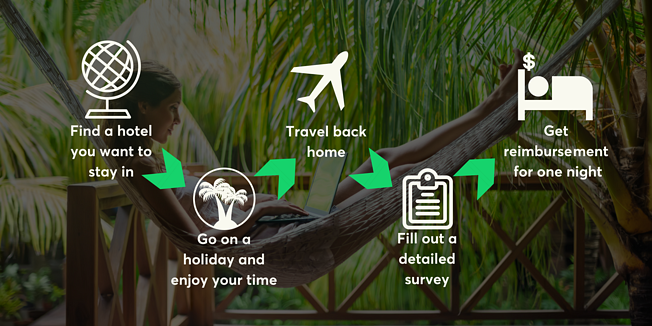 Mané: We recently undertook a study to uncover what guests really think of the surveys they are asked by hotels to complete. Only 3% of guests spend more than five minutes filling them out – and the vast majority only provide ratings. Though high scores might be a nice boost to morale, they do little to inform the hotelier what are their strengths and issues. 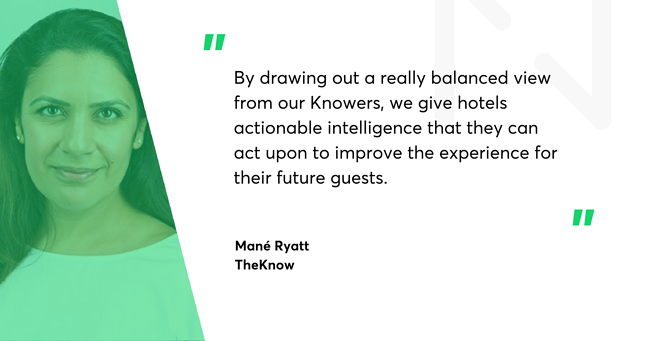 By drawing out a really balanced view from our Knowers, we give hotels actionable intelligence that they can act upon to improve the experience for their future guests. Natalia: Is there any minimum time guests have to stay at the hotel? Fiona: Our Knowers have to stay for a minimum of two nights at the hotel, one of which will be reimbursed. We’re making sure that it’s not just someone who’s looking for a free stay at the hotel – it’s someone who could typically both afford and want to stay there. Mané: They have to stay for at least two nights, but, quite often, they stay for longer. Natalia: Do you offer any other rewards for joining and contributing to the club? Fiona: We have a reward programme in which the Knowers collect loyalty points – known as Knowkens – based on the quality of their feedback for every KnowOpp (opportunity to review). A separate way of earning Knowkens is through inviting the right calibre of people who will provide high-quality feedback to join the club. Mané: Our top Knowers are rewarded based on their annual accumulation of points: additional nights’ reimbursement, a flight, or an invitation to an annual club party. We want our Knowers to feel like they are part of the club and enjoy the benefits and privileges in return for giving their feedback. It’s basically our way of saying ‘thank you” to them. Each survey they complete takes about an hour, so it’s a significant time commitment. Obviously, they get the reimbursement, but we also want to make them feel appreciated. Natalia: How does the system work exactly? Fiona: As part of the joining process, hotels inform us of their preferred review frequency and provide information on the hotel and the services and facilities available. Once we have all the information, we create a listing on The Know’s portal where our Knowers can search for opportunities to review. Knowers, on the other hand, join the club on an invitation-only basis – either directly from The Know or via existing Knowers. By making it invitation-only, we ensure that we have the right kind of people in the club as each person is asked a few key questions about their preferences and their previous experience with hotels. When the application is submitted, we vet the responses to ensure we are attracting the right kind of people who will make great Knowers. Once the person is on board, they can see all the hotels that have joined the platform and the KnowOpps that are available. If they’re interested in staying in a particular place, they can secure the KnowOpp on our website, but they don’t book their hotel stay with us – that is done directly with the hotel or with a travel agent. However, they would book normally. Mané: We want to make the holiday experience as natural as it would normally be. If a Knower can obtain a better deal directly with a hotel or through an online travel agency, then that is up to them. Fiona: Once the Knower secures the KnowOpp and books the hotel, they get a confirmation email with a link to the survey that should be submitted within seven days of completion of their stay. The Know checks the quality, clarity and comprehensiveness of the answers. Providing the review meets the required standard, we ask the Knower for a copy of their checkout invoice, and then reimburse them for a one-night stay, relevant meals and a spa treatment, if applicable. We then pass the review back to the hotel so they can see the full unedited feedback together with a bespoke hotel dashboard including trending over time, benchmarking with other hotels from their group, location and price range and the ability to create and monitor their own action plan. Natalia: What requirements does a visitor need to fulfil to become the Knower? Mané: Typical questions that we ask on the application form are “how frequently do you stay at hotels?”, “what was the last hotel you stayed at?”, “what did you like the most?” or “what did you like the least?”. If people give one-word answers, they probably won’t make the greatest Knowers. The whole point is that people need to be able to explain in sufficient detail what they liked or disliked and how certain aspects of the hotel made them feel. We can tell from the way people answer these application questions how good a Knower they are going to make. Natalia: What requirements are on the hotel side? Does it have to be a top-notch 5-star hotel? Mané: Our strapline is “Making Great Hotels Exceptional”, and our hotels are high-end and luxurious. Yet one thing I want to make clear is that it’s not about 5-star or £500 per night hotels only. You can get an exceptional hotel for £150 a night if you know where to look – it all depends on where you are in the world, the quality of the hotel, and the amount of time and effort the hotel puts into services and guest experience. Not always the most expensive hotels are the best hotels. Fiona: Sometimes it will be a hundred-room city hotel, other times it might be a ten-room country hotel. It is difficult to define rules, but the easiest way to do it is based on the places we typically like to visit and the feeling we get when we go there! We keep the standard high as hotels want to be compared to other hotels that provide similar quality of services. From the Knowers’ perspective, it has to be somewhere they want to stay and feel as though their insight is relevant. Otherwise, they won’t book it, even with a one-night reimbursement. Natalia: Do you have any direct competition in this specific niche? Fiona: There are other mystery guest and feedback services, but nobody does it the way we do, and that differentiates us. Natalia: What were the major challenges you faced in building your business? Fiona: It’s been a major shift from the corporate world to the world of entrepreneurship for both of us, which brings some exciting and refreshing opportunities, but, at the same time, the stakes feel a lot higher! We have always been very success-driven, and that’s even more heightened now that it’s our own business! Also, we’re new in the industry, so we’ve worked hard to build our credibility and market our brand, which takes time. Natalia: How did you come up with the name? Mané: We didn’t want it to be too obvious because the whole point is that it is a select club – either you’re in The Know or you’re not. Fiona: We are providing hotels with information that they can’t get elsewhere. It’s an untapped mine of information. When you think about it in that way, the name The Know fits. Also, for the reviewers, if they’re in the club, they’re “in The Know”. Natalia: What does the platform look like from the technology perspective? How complex is the system? Mané: In essence, it’s very simple. User-experience is top of our agenda, and the complexity of our business model comes from the fact that we have three user groups: hotels, reviewers and us in HQ who all need different views of the same data. We have to be careful that we don’t overcomplicate it. However, in banking, we were engaged in various projects that involved large-scale systems, more complicated than this one, which has served us well. Natalia: What’s coming up next? Next milestones, goals? Fiona: We exhibited at the Independent Hotel Show in October here in London. It’s a well-renowned trade show for luxury, independent and boutique hotels. We had a great show and are now pursuing some strong leads and interesting partnerships. From an operational perspective, we’re looking forward to our next big release with the team from Netguru at the end of November.